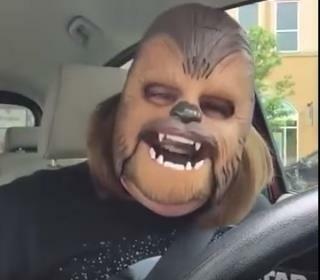 $3,000 in swag from Kohl's, where she bought the mask, including $2,500 in gift cards and Chewbacca masks for the whole family. $7,500 in trips to California and New York to visit talk shows, Lucasfilm Studios, Facebook, and more. $7,500 vacation to Disney World. $2,000 trip to Fan Expo in Dallas. $400,000 in college scholarships for her whole family to attend Southeastern University in Florida. Just seems ridiculous that this woman puts a kids mask on and laughs a stupid forced giggle and gets this kind of attention. There are people out there that actually do great things for their communities that don't get 1/10th this much media. Just absolutely a silly American thing to do. Very sad ..kind of like the horrible Kardashian media frenzy. Wait, wait, wait. Am I missing something? A woman puts on a silly mask, laughs and she and her family get college scholarships? This makes absolutely no sense at all. What is wrong with this picture? What is wrong with this country? 420 strikes again. I'll smoke to that.